Panoramic photo of the Aircrew and ground crew of No.464(Australian )Sq. No. 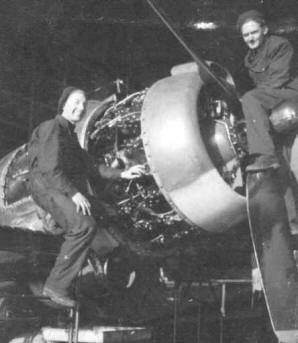 487 (New Zealand) Squadron and No. 21 Squadron. Photograph is most likely taken in early 1943 at Methwold. Certainly taken before the Amsterdam raid of 1943, (Sq. Ldr. Len Trent VC) is on the front row. It is reasonable to assume that many of the men on this photograph were killed over Holland. Photograph provided by Mr Cecil Ives. A much larger version showing the faces in reasonable detail may be requested by email - it is approx. a 1meg file. An engine change in the No.1 Hanger at Feltwell. 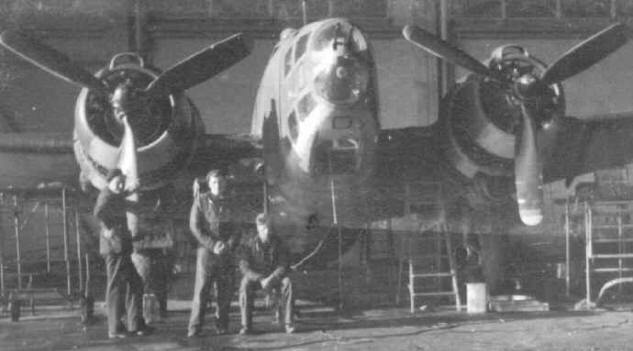 Ground crew of 464 (Aus.) Sq. Names not currently known. The photograph above is of three ground crew of No. 464 (Aus) Sq. taken in front of a Lockheed Ventura in the No.1 Hanger at Feltwell. The man seated is Mr Cecil Ives, the other two airmen are currently unknown.